Fingles Metalworks Fingles Metalworks - Fingles Metalworks takes great pride in providing craftsmanship, running safe and timely projects while creating our customer's visions. We expect our work to build relationships, while profits take a backseat to our reputation and accountability. It is our mission to provide you, our partner, an unparalleled experience. Fingles Metalworks takes great pride in providing craftsmanship, running safe and timely projects while creating our customer's visions. We expect our work to build relationships, while profits take a backseat to our reputation and accountability. This is all evident through transparent and effective communication with our customers. Fingles Metalworks has been forging relationships with both local customers in the Baltimore / DC area as well with nation vendors and customers. We do not restrict ourselves by the size of the job and seek out new opportunities. We maintain a diversified client list with all industries including; chemical, food, pharmaceutical, and energy. In other sectors we focus on miscellaneous metals and architectural work for new and historical construction work. In the elevator and escalator industry, we specialize in custom finish metal work from wall panel systems to finished cab interiors. We have a long history of providing craftsmanship to our customers and hope to add you to our family also. Our customers have an endless list of designs that we can bring to life within their building designs. We use a large array of materials including aluminum, stainless steel, copper, brass, and steel. We also provide a variety of patinas and finishes such as blacken steel or bronze. 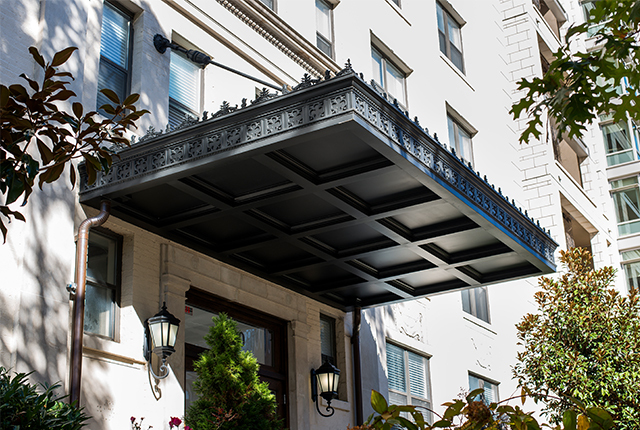 We specialize in the fabrication and installation of custom canopies for new construction and historical restorations. We pride ourselves on our diversity and being able to work with fellow Artisans. 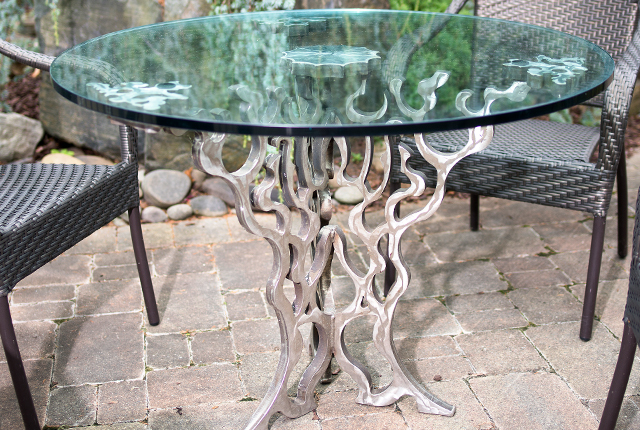 We can create or fabricate many custom pieces: shelves, fixtures, furniture, sculptures, etc. We operate in-house both a Hi-Def Plasma cutting system and a Waterjet. While our Hi-Def Plasma can support quick and easy mass production of parts, our waterjet system can achieve tight tolerances without having to do any added machining. Our newly acquired engraver is extremely versatile. Its capable of engraving on hard surfaces such as stainless for lettering or make use of the diamond engraving to make custom works of art on your metal. Our equipment includes heavy-duty shears, plate rollers, and presses to form heavy plate. We provide and install engineered common center decking suited to your needs. 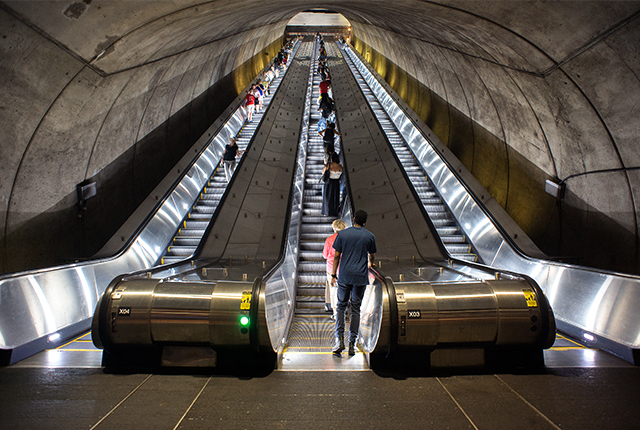 Our cladding systems our designed per your architectural requirements and are backed up with engineering for your specific escalator unit. Rigging Fabrication services for temporary framing support systems and gantries. Elevator Cab Interiors, Hoistways, and Doors: We can provide any finish that is required for the project. Black Iron, Stainless Steel, Brass, custom oxidized and lacquered finishes available. We provided welding services to repair damages to existing trusses or any misc. welding that might be required on the job. Emergency Repair and Custom Fabrication Parts. 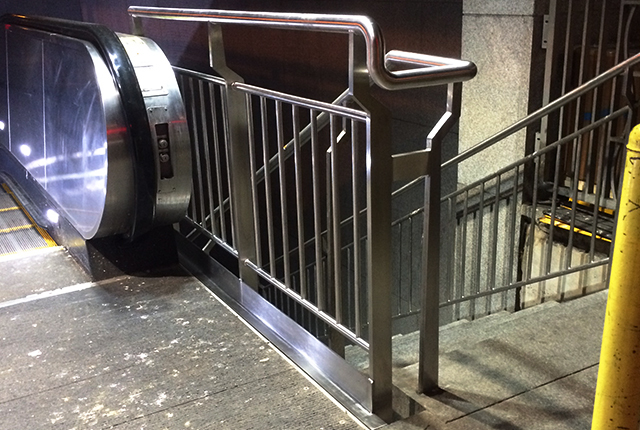 We can provide custom solutions and modifications to all your existing components; handrails, button plates, cladding, guards, etc. Our journeymen are qualified to handle the maintenance, installation, or repair of your equipment. We provide installations on both threaded and welded pipe, ranging from standard carbon steel and stainless pipe to alloys such as Hastelloy or FRP piping. 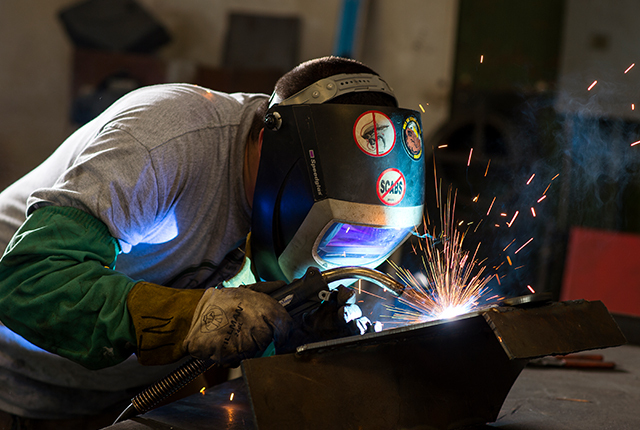 Our welders are ASME certified Stick, MIG, and TIG from 6G all position pipe to 4G structural. Fingles performs a wide array of Industrial Fabrication including but not limited to: Tanks, Hoppers, Chutes, Guarding, Platforms, and Various Custom Equipment. Whether looking for a standard industrial guardrail for a facility or custom ornamental handrails for a grand staircase we are capable of designing and installing to meet your needs. Fingles can provide fabrication and installation of all of our work. Equipment platforms, rooftop units, building expansions. Custom fabrication of countertops – Black Iron, Stainless, Brass, Copper, Zinc. Looking for individuals knowledgeable in miscellaneous metals and ornamental metals, who can develop a plan for a project from pre-construction through to completion and ensure that project will complete on time and on budget. This individual will need exceptional communication skills between the company and client. Looking for estimators familiar with miscellaneous metals and ornamental metals who can interpret and understand contractual terms and conditions. This individual will be responsible for developing accurate and well-organized proposals with clear and detailed take-offs.